The team reached a total of 54 agencies between the regions of Boyacá and Eje Cafetero, training 215 travel agents outside of the Colombian capital; there has been an increase in the average expenditure, number and length of stay of Colombians to the region. Rafael Moreno, a destination manager for Colombia who represents the Riviera Nayarit Convention and Visitors Bureau and the Puerto Vallarta Tourism Trust, helped organize visits to travel agencies in this South American country during April of this year. “Colombia continues to increase the number of tourists it sends to the region, which is why we didn’t focus just on the capital but expanded into the regions that have excellent purchasing power together with Aeroméxico so we would have adequate air connectivity to the destinations,” explained Marc Murphy, Managing Director of the Riviera Nayarit CVB. The Riviera Nayarit CVB’s Barometer revealed the Colombian tourist who visits the Destination has practically doubled their average total expenditure in 2016 as compared to last year, spending around US$8,584. The density of Colombian tourists has also nearly doubled from the year before, increasing from 2.73 to 4.71. The length of their stays has also increased year after year, hitting the one-week mark with an average stay of 7.29 days this year. 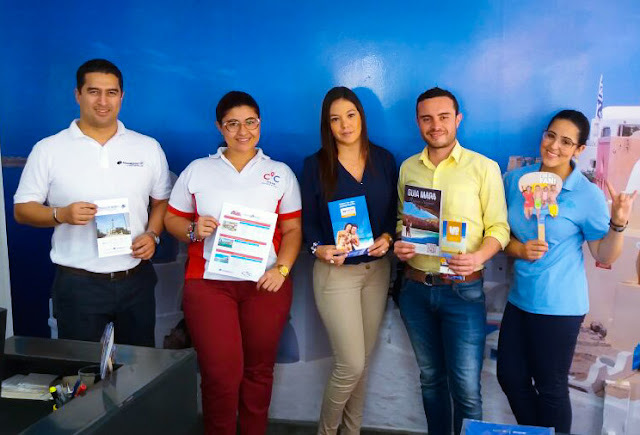 The activities in Colombia consisted of informing, training, distributing promotional material and answering any questions for the travel agents regarding the Riviera Nayarit and Puerto Vallarta Joint Campaign. The team visited a total of 54 travel agencies between the regions of Boyocá and Eje Cafetero, training 215 travel agents. First up was the Boyocá region, where they visited Duitama, Sogamoso and Tunja together with Travel Depot, stopping at five travel agencies and training 24 agents. This was followed by a visit to the Eje Cafetero region, where they stopped at Armenia, Pereira and Manizales. CIC Colombia, Aeroméxico, Travel ACE and Hard Rock Hotels accompanied the team on this occasion. This second round reached a larger audience of 49 travel agencies and 191 agents.